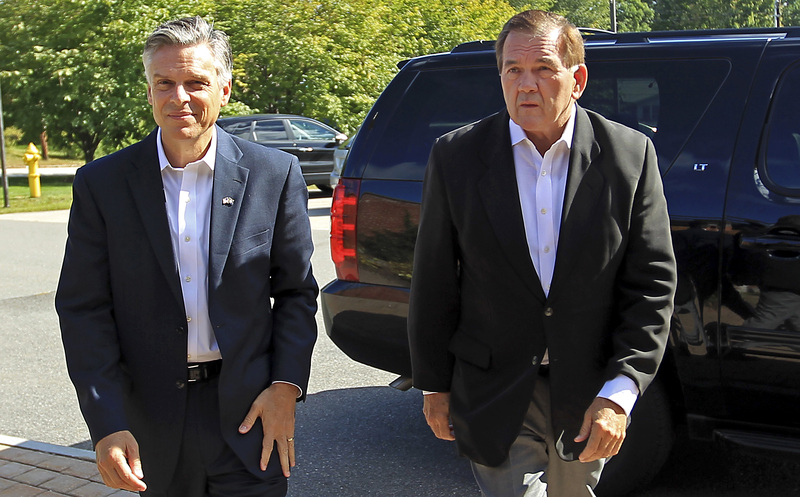 Former Homeland Security Secretary Tom Ridge on Friday endorsed Jon Huntsman in his bid for the Republican nomination for president, handing Huntsman his first trophy in the endorsement sweepstakes kicked off by Huntsman's GOP rivals earlier this week. Ridge is a popular former governor of Pennsylvania, a presidential battleground state. Appearing with Huntsman at St. Anselm College in New Hampshire, Ridge called the former Utah governor and ambassador to China "the only candidate with demonstrated success at the state, national and international levels." He said that Huntsman "has the unique ability to bring people together, to build consensus around the kind of ideas and the kind of change we need to affect to make America more secure, more prosperous, and more competitive. "I'm certainly proud to join him on this podium today to publicly announce my strong support and endorsement of a man who I think would be a great president of the United States of America. A great country needs a great leader with a great vision and I think he's standing next to me." Ridge, who runs the consulting firm Ridge Global in Washington, D.C., was the nation's first secretary of Homeland Security, appointed to the newly created post by President George W. Bush in 2001, after the September 11 attacks. Huntsman said of Ridge, "Tom successfully mobilized our government's efforts to protect our families and loved ones from danger. I look forward to working with him to spread our message of serious, bold solutions across the country." Ridge left the post in December 2002. He was Pennsylvania governor from 1995 to 2001 and served in the U.S. House from 1983 to 1995. The announcement was the latest in a series of high-profile gubernatorial endorsements in the race. Former Minnesota Gov. Tim Pawlenty, who dropped out of the contest last month, endorsed former Massachusetts Gov. Mitt Romney. Nevada Gov. Brian Sandoval and Louisiana Gov. Bobby Jindal have endorsed Texas Gov. Rick Perry. Huntsman trails Romney and Perry in the polls, but he said Friday the polls are not necessarily a good indicator of his chances in the state's first-in-the-nation primary. "Ninety percent of the people in this state are undecided," he said. "That tells me something about how deliberative the process here in New Hampshire is. Even with a field of candidates, some of whom have been around here before, I like our chances. I like our position. "We're just beginning to introduce ourselves to the people of New Hampshire and the people of the United States. Takes a while in this state," Huntsman said as Ridge nodded in agreement.